This activity gives members a chance to experience a different format. 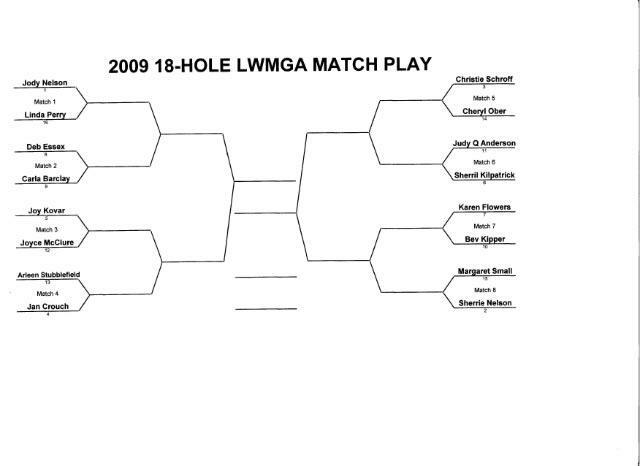 In match play the game is played by holes. A match consists of one side playing against another over a stipulated round. A hole is won by the side that holes its ball in the fewest strokes. In a handicap match, the lower net score wins the hole. The state of the match is expressed by these terms: so many "holes up" or "all square" with so many holes "left to play." A hole is halved if each side holes out in the same number of strokes (including handicap adjustment). A match is won when one side leads by a number of holes greater than the number remaining to be played. Members must have an established GHIN handicap. Must have an e-mail address. Must pay the $5 entry fee to Bev Kipper prior to tournament start. In addition to receiving updates by e-mail, you can check back here for information as 2009 Match Play progresses.